Independent & Group Botswana Tours Packages in 2019/2020 from Travelbag. 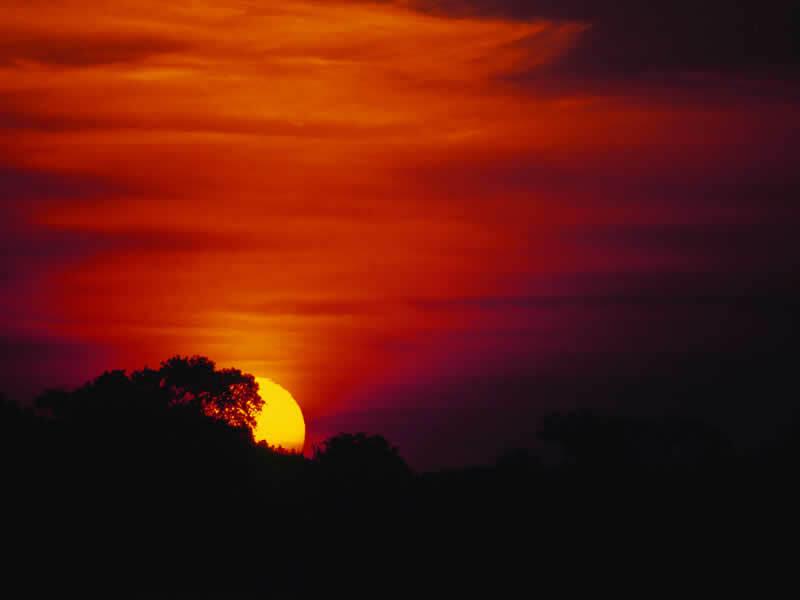 Often heralded as Africa’s prettiest jewel, the spectacular landscapes of Botswana shimmer in shades of emerald, sapphire and gold, a breathtaking setting that encapsulates the qualities of Africa in one mesmerising country. With an area of 580,000sq km (slightly larger than Spain) and a population of just two million concentrated in the lesser travelled south eastern side, you won’t come across too many people when you visit Botswana. 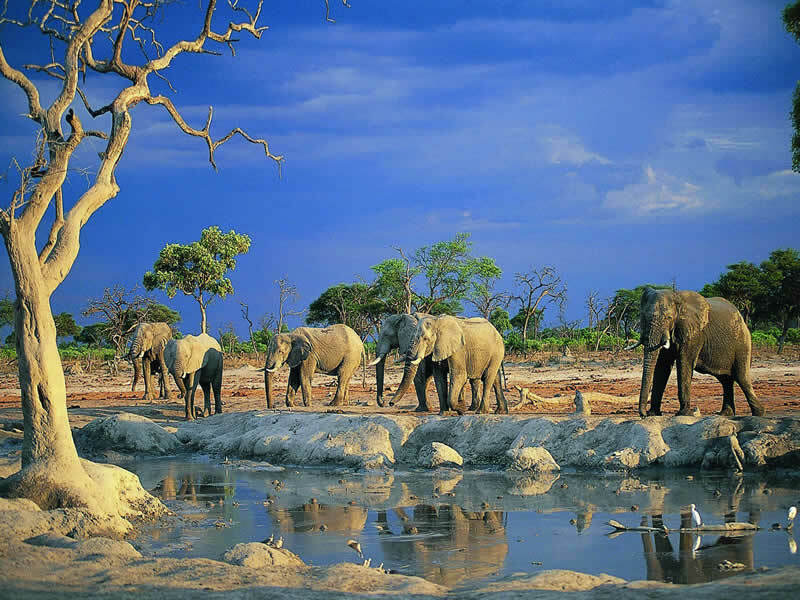 Instead, you will make acquaintance with its abundant wildlife, where elephants, lions, wildebeest and giraffe amongst others roam a land of extraordinary geological traits, from the desert plains of the Kalahari, to the harsh salt flats of Makgadikgadi, to the stunning channels of the Okavango Delta. 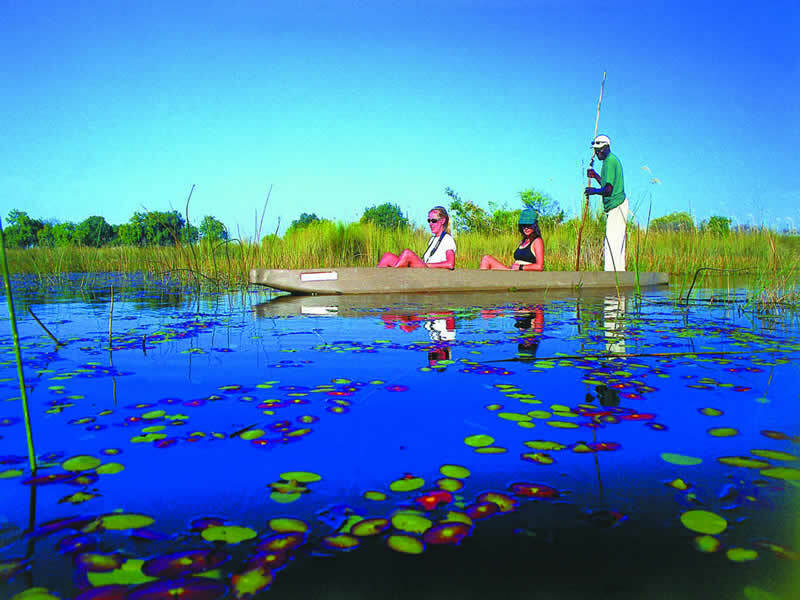 For many, Botswana’s most spectacular attraction is the Okavango Delta, particularly in the midst of the annual rainfalls when water overflows the banks to spill onto the sandy land, creating a fertile, island-dotted landscape that attracts a plethora of wildlife to its bountiful shores. Covering between 6,000 and 15,000sq.km of land, the water feeds a diverse eco-system with every passing year, one that prompts flora to grow and fauna to reside. The sheer abundance of the revitalised land, coupled to its proximity to the Chobe National Park, ensures all manner of wildlife can be viewed, including elephant, rhino, giraffe, lion, leopard, crocodile and wildebeest, though this depends on time of year and food availability. With the usual bronze of the desert being interspersed by lush greenery and clear waters, the scenery in the Okavango Delta makes this natural phenomenon a sight to behold. 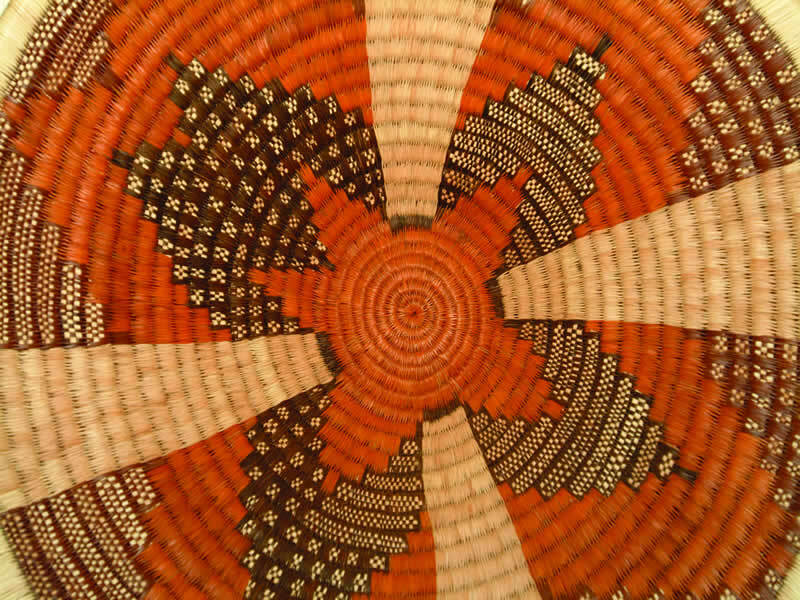 This is best appreciated aboard a traditional mokoro, a boat that is paddled by a local guide who will regale you of the wonders that surround you. 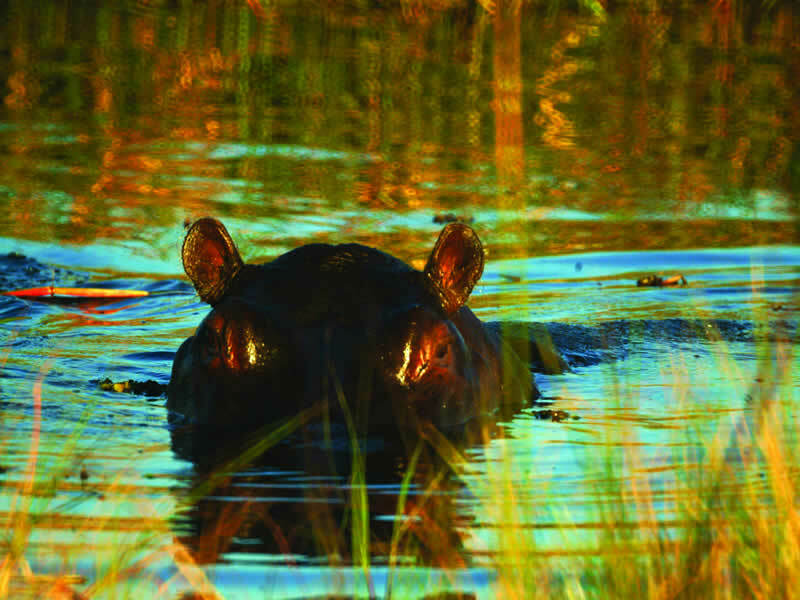 The proximity to the Okavango Delta means the neighbouring Chobe National Park to the west and the Moremi Game Reserve to the east plays host to a diverse array of wildlife, making it ideal for safaris viewing the ‘Big Five’: Lion, Elephant, Leopard and Buffalo and Rhinos. Though it forms part of the Kalahari desert basin, the salt flats of Makgadikgadi National Park is entirely unique to it. Vast swathes of stark, featureless terrain stretch far and wide, the flat land dusted only by a harsh film of salt. Makgadikgadi is actually made up of a series of inter-connecting pans and was originally one of the world’s largest lakes before it dried up thousands of years ago, leaving behind the flat, salty terrain. Though seasonal rains allow water to form into a stunning powder blue lake, no vegetation can survive beyond the more fertile fringes, so wildlife tends not to venture here. Bleak, yet strangely beautiful as the blank landscape sets against the cobalt blue skies, while there may not be much to see in Makgadikgadi, the sheer scale of its emptiness – the size of Portugal no less – means it is worth witnessing regardless. Botswana’s most famous residents remain its animals though, the abundance of lions, elephants and hippos making it the ultimate holiday destination for those partial to a spot of live wildlife spotting. The Okavango Delta and Chobe National Park are not only some of Africa’s most spectacular natural marvels, they are some of the world’s most beautiful, diverse and splendid corners of the world. Even when the land dries up further south in the Kalahari Desert and the Makgadikgadi Pans, Botswana is never anything less than spectacular. The spectacular Victoria Falls are one of the world's great wonders. 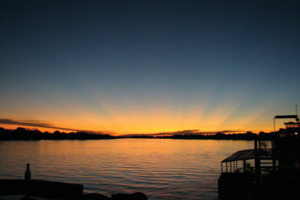 This short tour packs in all you need from a tour of the Falls to a Sunset Cruise on the mighty Zambezi River. 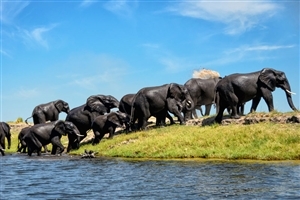 Spend 5 days discovering the spectacular splendour peppered across the amazing landscape of Botswana, from gorgeous cruises across the Zambezi, to game drives through Chobe National Park and on to sunset cruises along the Chobe River, sharing the waters of Africa with the local herds of elephants that make this amazing area their home. 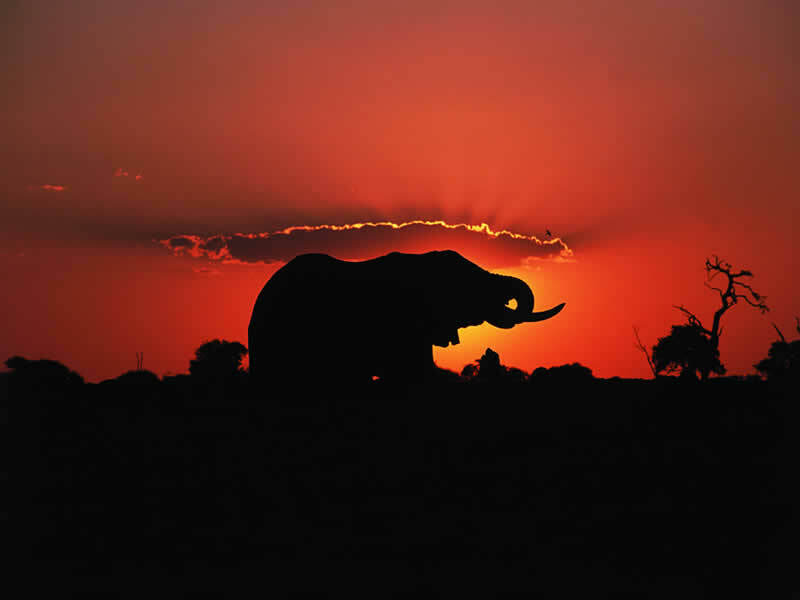 See Africa at its most spectacular by fulfilling your dream of a Botswana holiday, where you can explore a diverse land of desert, salt flats and waterways, admire majestic elephants, lions and giraffe, and watch nature evolve around you. A Botswana tour is the ideal choice for anyone keen to experience the very best of Africa, with our comprehensive itineraries including safaris of Chobe National Park, boat trips on the breathtaking Okavango Delta and trips into the Makgadikgadi salt flats. A Travelbag Botswana tour includes the option of fully-arranged safaris that take you into the heart of these natural habitats, flexible independent tours and escorted tours helmed by our team of friendly and knowledgeable guides. For more information about Travelbag’s excellent range of Botswana tours, call 0203 944 2201 to chat with one of our knowledgeable travel experts about creating the perfect Botswana holiday for you. 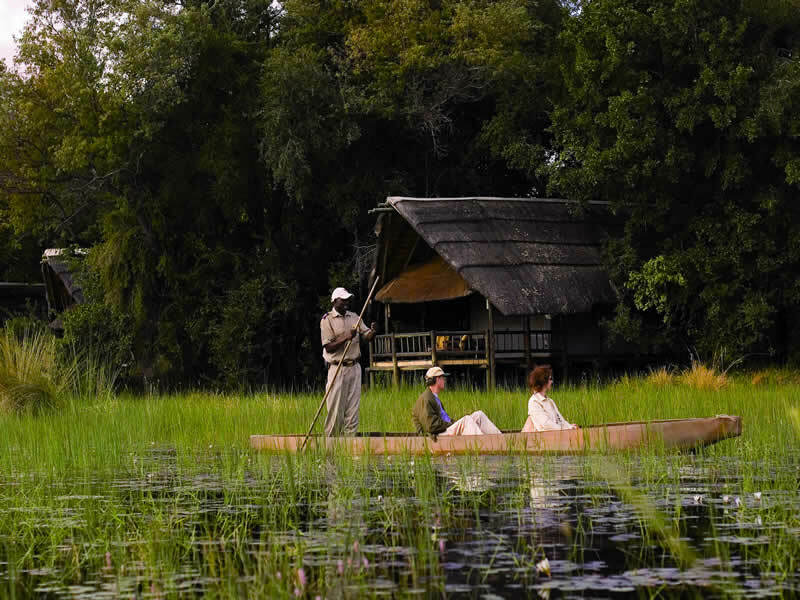 Float across the breathtaking Okavango Delta - Silently cruise the waterways of Botswana’s Okavango Delta, an area rich in exotic wildlife and unique scenery, inside a traditional ‘Makoro’ canoe. 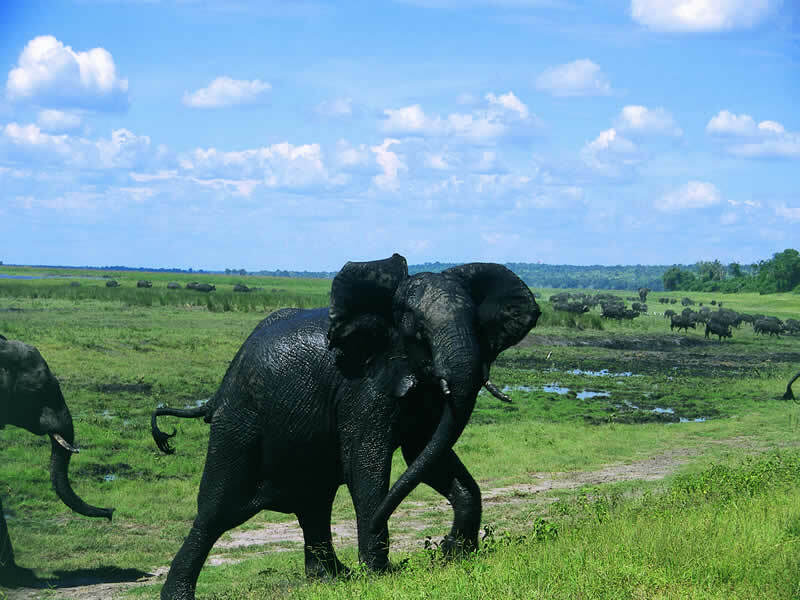 Elephant-spotting in Chobe - The wildlife rich plains of Chobe National Park are ideal for spotting some of Africa’s renowned predators, including packs of lions and herds of elephants. Visit another world - Discover a land unlike any other in Africa with a visit to Botswana’s Makgadikgadi salt flats, where the stark, other-worldly scenery will leave you captivated. 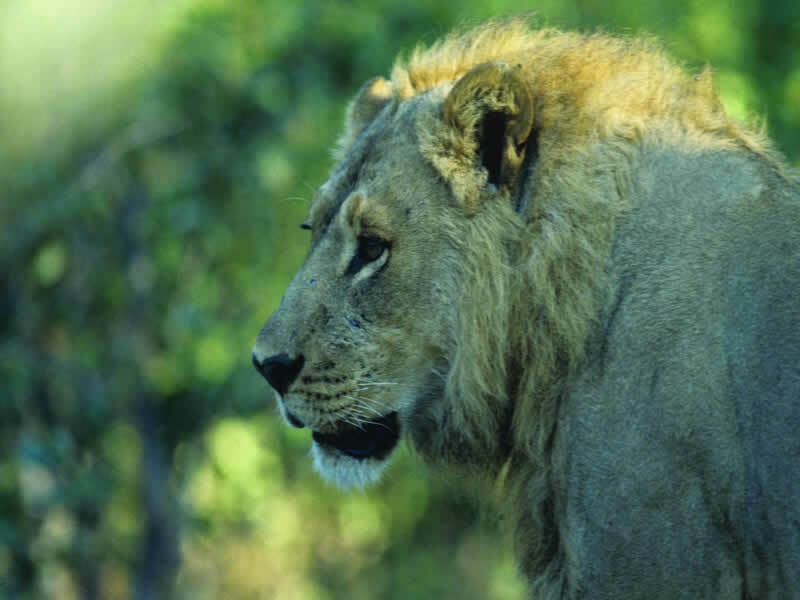 Chase the ‘Big 5’ in Moremi - Venture into Moremi Wildlife Reserve for an unforgettable safari and game drive in pursuit of the notorious ‘Big 5’. Take flight over Botswana - Take advantage of the scenic flight transfers between the camps to admire the finest views of Botswana’s incredibly diverse landscape. 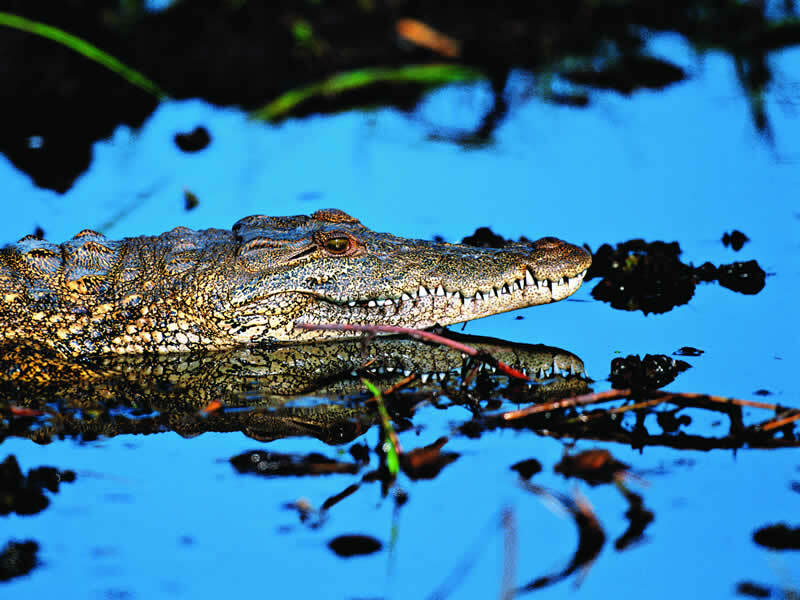 Explore Botswana’s evolving channels - Explore the calm, clear waters of the Okavango Delta’s papyrus channels, an ever-changing network of waterways formed by the annual rainfall in neighbouring Angola and the subsequent floods. Stay in style - Experience Botswana in style with a stay in luxurious en-suite tented lodges as part of Travelbag’s tour accommodation packages. Admire the pants of Makgadikgadi - Gaze across the unusual pan complexes of Sua, Nwetwe and Nxai, where large herds of zebra and flocks of exotic birds can be found. 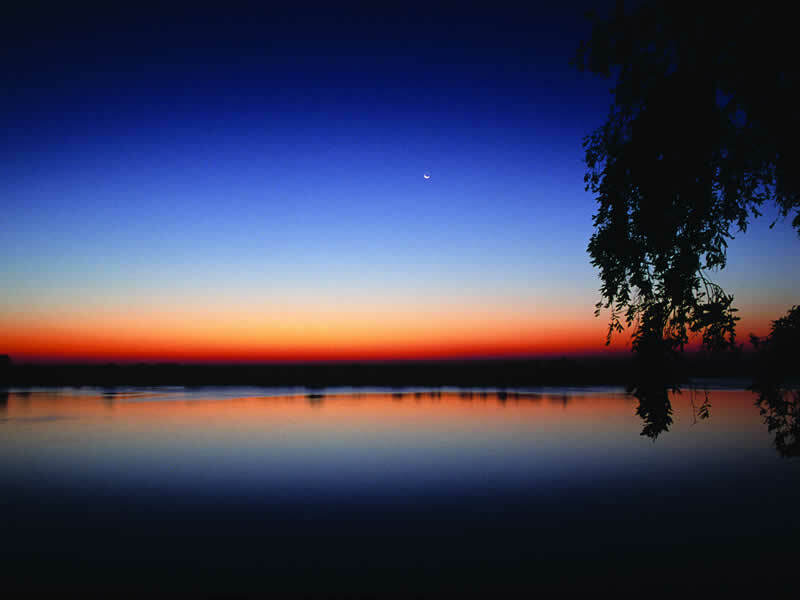 Set sail across the Chobe River - Set sail on the calm waters of the Chobe River to witness an epic sunset as it descends beyond the horizon. 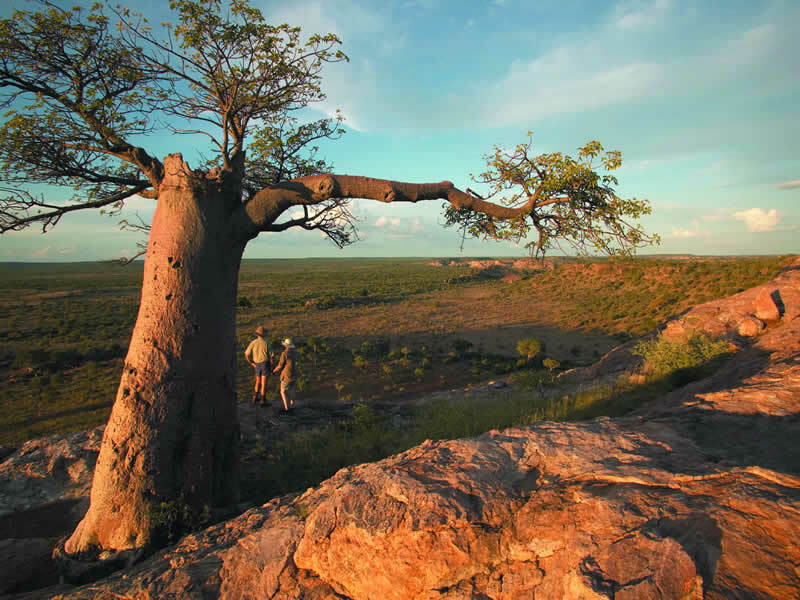 Cross the Kalahari plains - Traverse the flat, semi-arid plains of the Kalahari Desert, the second largest game reserve in the world, in search of the resident leopards and giraffe.